“We need to get a puppy collar and a puppy leash,” I informed Jeremy. “What happened to Kaweah’s old puppy collar?” he asked sifting through the pile of dog towels. Even though Kaweah was not a large dog as labs go, all of her beds and toys and blankets look huge compared to the little puppy we visited two weeks ago. We don’t want to buy too many puppy-sized things because they won’t be needed after a month or two. So we’ve been re-engineering the crates and beds to create nice and cozy smaller spaces for puppy. 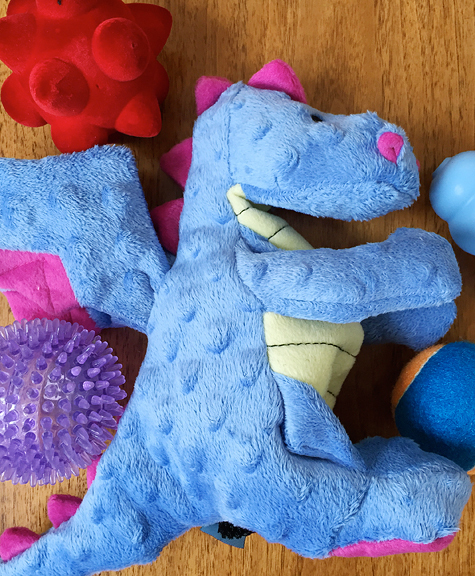 I sifted through our basket of Kaweah’s toys this week and pulled out three plush fish – a pink one, a blue one, and a green one. They were otherwise identical in every way including the hole at the top of each of their heads where Kaweah had systematically pulled out the squeakers and chewed them to bits. “Do you think puppy will be a destructo-dog like Kaweah?” I wondered aloud while sorting the salvageable toys from the heavily loved ones. To be fair, Kaweah only destroyed her toys and left everything else in the house alone. She was a good bad dog. I’m in the process of sewing up the old plushies for puppy’s crate so she can hopefully feel comforted by the smell of Kaweah and the contact with other soft bodies to mimic her littermates. But we still picked up some new puppy-appropriate toys. It looks as if this cold weather pattern will hold for another week or two. I’m ecstatic! 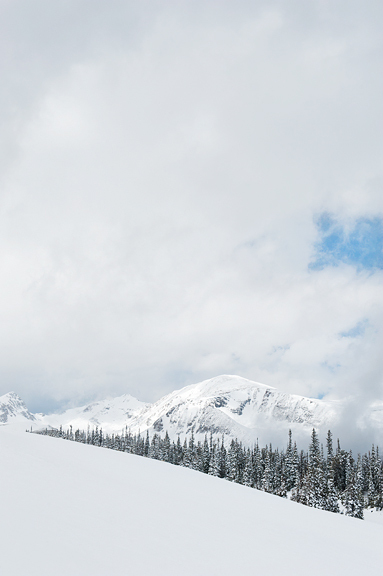 Not just for the skiing, but because we’ll be able to introduce the pup to skis. One might think it’s no big deal, but most of the dogs I know have interesting reactions to skis. Back in the day, Kaweah didn’t realize that they were attached to our feet, and thought it was a really fun game to pounce on the tips as they protruded through the snow. Other dogs think ski poles are totally awesome “sticks” to grab hold of. 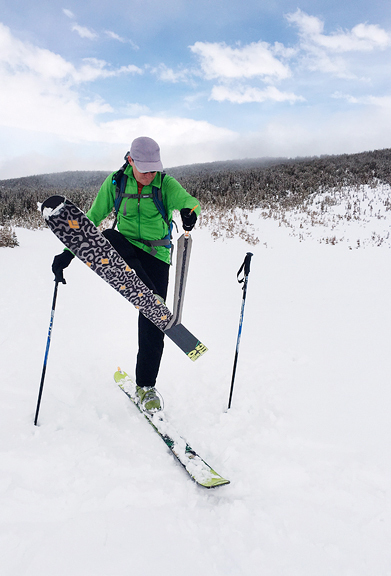 When the snow is deep, Banjo likes to walk on the back ends of Erin’s skis for extra floatation and to stay close. Thankfully, most dogs figure it out eventually. 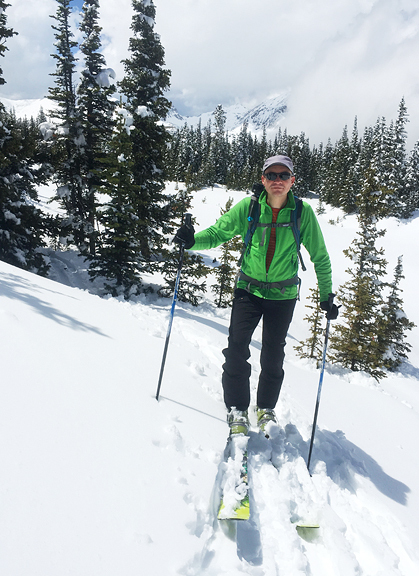 Of course, puppy won’t be able to travel far at the start, so we got out into the backcountry to get our pre-puppy ski fix. But not everything around here is all puppy all the time. Not yet, anyway! Jeremy finally kicked his Man Cold this week. I decided we should celebrate with some appetizers and dinner while watching the season finale of Agents of S.H.I.E.L.D. I made the appetizers for Jeremy more than for myself, because they were made of a few of his favorite things. 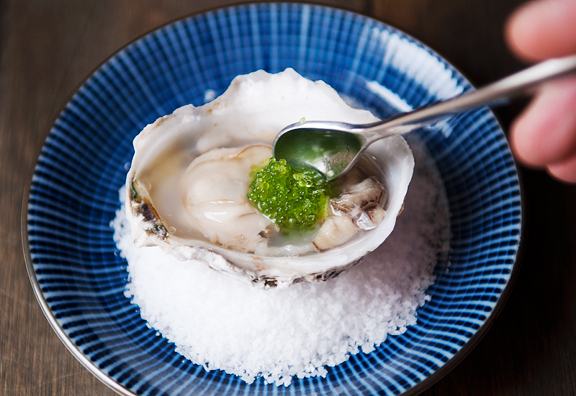 For the past few years, Jeremy’s favorite way to enjoy oysters has been raw with a mignonette. I don’t mind a few raw oysters, but I really fell in love with fried oysters on my most recent trip back home to Virginia. However, preparing raw oysters is far far easier than frying them. Rather than go with the same old same old, I thought it would be fun to mix things up – try something different. If you’ve never shucked an oyster before, you might want to read my tutorial on shucking oysters. Currently, my favorite oyster knife is the Dexter-Russell 4-inch Galveston-style Sani-Safe series. And as a precaution, I always wear an oven mitt on the non knife-wielding hand. Shucking oysters is way more fun without a trip to the ER. 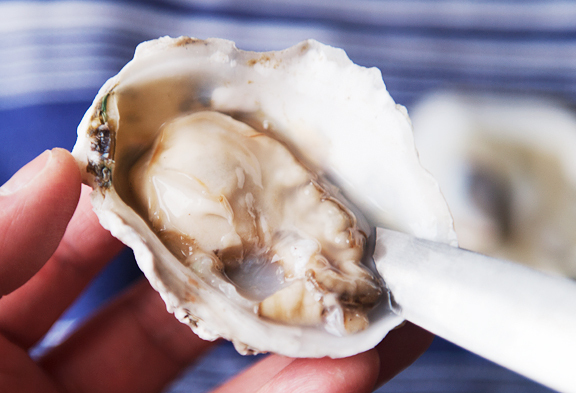 Be sure not to lose any of the precious oyster liquor – that natural liquid in the oyster shell. It helps to select oysters that have deep bowls to hold all of the goodies. 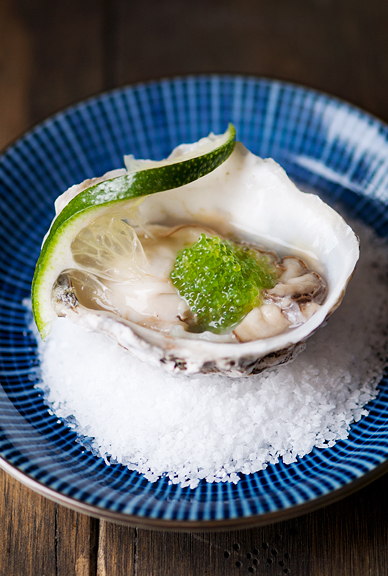 To hold those wobbly oyster shells in place, set them on a bed of kosher salt or shaved ice. Or if you aren’t worried about presentation, wet paper towels or wet kitchen towels will suffice. Fill the oyster shells with your favorite gin. We tend to like local floral gins like CapRock or Rhok (formerly called Roundhouse). A liquid dropper would be ideal for this, but I only had a baster which worked just fine. Next, place a little clump of caviar on top of the oyster. Try to avoid dropping the caviar into the liquid or it will collapse and float around. Jeremy was rather smitten with these gin oysters. 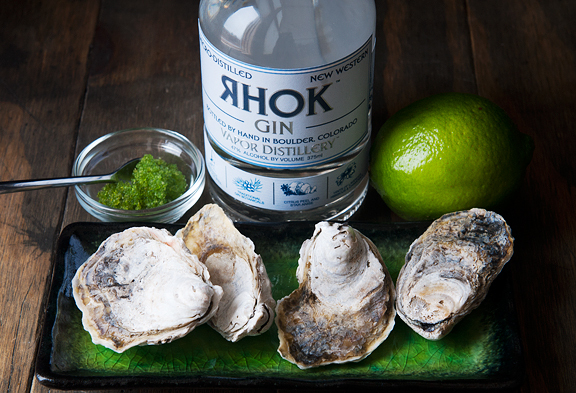 It’s hard to argue with a pairing like gin and oysters. We did experiment with a couple of types. Both of us preferred sweeter, less briny varieties with the gin. You can use any kind of caviar here, but I like the wasabi tobiko for the added crunch, color, and extra zing from the wasabi. Wasabi tobiko can be found in the frozen section of some Asian grocery stores. So the next time you want to change up your oyster game, this is an easy and delicious alternative to the ordinary. It’s best if you can select oysters with deep rather than shallow bowls (the rounded side) so that the liquids won’t spill as easily when serving. 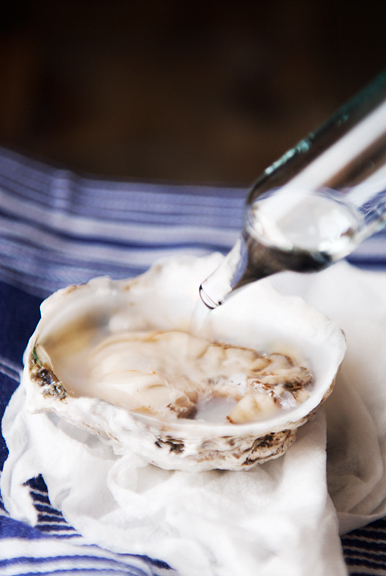 Shuck the oysters, keeping as much of the oyster’s liquor (the natural liquid in the oyster) as possible. 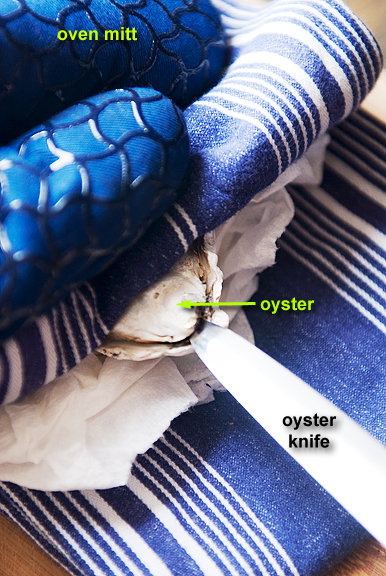 Run your oyster knife along the bottom of each oyster so it is no longer connected to its bottom shell. Discard the top (flat) shells. 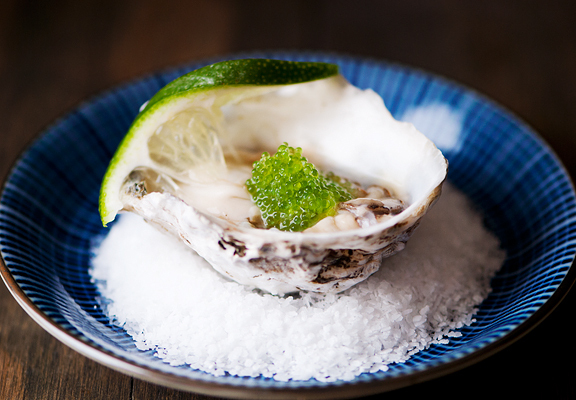 Set the oysters on a bed of kosher salt or shaved ice. Fill each oyster shell with gin until almost full (a dropper or baster is handy). The amount of gin will depend on the volume of oyster liquor in the shell. Place a tiny dollop (about 1/8 teaspoon) of caviar on top of each oyster. Try to place it directly on the oyster and not into the liquid as it may fall apart and disperse. Garnish with a lime slice or wedge. Serve immediately. Something about the texture of raw oysters that have always made me flinch. But I’d certainly try them sitting in gin. I think I’ll make a note to put these on the menu for July 4th, along with pork buns, your famous recipe that everyone looks forward to, myself included! Patiently waiting for puppy adventures to begin! Absolutely beautiful! If you like floral gin, I would strongly recommend Ballast Point’s Old Grove from San Diego. Ballast Point makes pretty killer beers, but their spirits are absolutely top notch (drinking some of their light rum with Italian coconut-lime soda while writing this). Not sure if it’s available in CO yet, but you might get lucky at Applejack! Whew! I think I am almost excited about Puppy as you guys are! I wait every few days for some update on this precious one. Love hearing about the pup and can’t wait to see some pics! Sorry…oysters are ick to me. But I do love that you saved, and will be mending Kaweah’s toys for baby Yu/Darling. Have you read the book of poems called ‘Dog Songs’ by Mary Oliver? I think you will like it. Lovely presentation! Twila introduced me to your blog last year. Love all your wonderful photos and LOVE raw oysters so I’ll have to try this out soon, especially since my partner distills that very gin. Casey – thanks for the rec! debbie – lots of puppy pics now! Jasmine – I haven’t, but thanks – I’ll look into it! Marin – oh, how AWESOME! Great gin!